In the ever expanding list of highlighted countries, being vaguely in the direction of the Himalaya seems to compel this blogs' author to churn out another summation of possible soak sites. In this respect the country referred to as Mongolia is next in line. So have I determined. Having a culture which partially stems from the other side of the Himal seems to be a major swaying point to include Mongolia as an entry in this blog, though no doubt images conjured of soakers viewing the rolling steppe limited only by the end of the horizon has a great part to do with aforementioned decision. But will this remain a dream? Mongolia, we learn, is not a real geothermally active place but nontheless the readable article on harnessing the nation's warmth (Tseesuren, 2001) does list 40 odd hot springs. Though seen mostly from the perspective of possible future power generation it does briefly touch on Mongolian soakers. 'People have used hot springs for bathing and washing clothes since the dawn of civilisation in many parts of the world. In the same way, Mongolia has a considerable experience in health resorts using geothermal water'. This expression seems to contrast with what seems to be a commonality within Mongolia: the lack of a bathing culture as such. 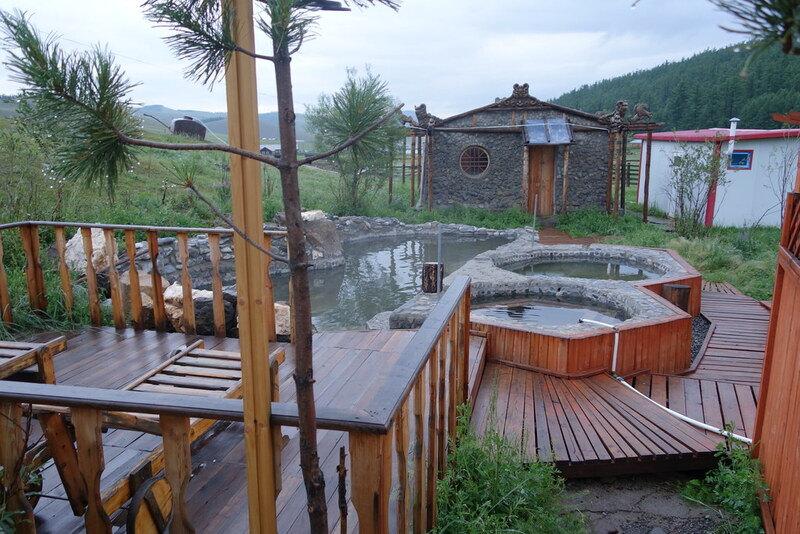 No doubt with the temperature being exceedingly cold most of the year, bathing may not be Mongolians number 1 love. Then again the same temperature must surely make soaking in hot water irresistible to most. Following is a list of over 40 hot springs which Tseesuren (2001) sums up but to which I've been unable to add any additional info. These little known hot springs are Utaat Minjuur (Domod province (or aimag)), Bol Tal, Chuluut, Tsagaan Sum, Gyalgar, Noyon (all Arkhangai), Tsetsuuh, Zaart, Khojuul, Otgontenger, Ulaan Khaalga (Zavkhan), Euruu (Selenge), Saikhan Khulj (Bulgan), Khamar, Gyatruun, Sharga, Emt (Uvurkhangai), Tsokhiot, Uheg, Örgööt (Bayankhongor), Bulgan (Khovd), Gants mog, Chihert (Bayan Ulgii), Salbart, Urtrag, Tsuvraa and Khunjil (Khuvsgul). Also note the excellent Bradt Mongolia guide (author Jane Blunden) which has an overview of over 80 hot and cold Mongolian springs (see also appendix). 'According to tradition, Zanabazar identified up to twenty individual mineral springs here and gave very specific instructions on how they were to be used'. 'The best time to use the springs is in the spring or autumn, and and for a full treatment they should be used daily for regimens of twenty-one, twenty-seven, or thirty-one days. Odd-numbered days are considered better. Also, there is one day in each month which is thought to be the most beneficial to use the springs, for example the eighth day of the eighth month, according to the Tibeto-Mongolian lunar calendar'. I wonder whether more is known about best soaking days. Are they dependent on a lunar calender of sorts? '... it was Zanabazar, the First Bogd Gegeen of Mongolia (1635–1723) who reportedly first studied the medicinal properties of the Onon Hot Springs Complex. They are thought to be especially suited for treating lower back problems, which is why Zegvee and I came here. There are nine bathhouses at the Hot Springs, each with water of differing water temperatures. The usual course of treatment is to soak in the cooler hot springs and then proceed to the hotter ones'. 'Here are at least fourteen different mineral springs, some of them with boiling-hot water, and several bathhouses. Two of the larger springs, both enclosed by bathhouses, are called Ikh Tsenkher and Baga Tsenkher (“Big Blue” and “Little Blue”), names reportedly given to them by Zanabazar himself, The springs here are famous for treating diseases and afflictions of the lower body: knees (mud packs taken from near the springs are especially good for knee joints), lower back pain, kidney and liver problems, and also rheumatism and sore muscles in general'. 'The hottest spring of Mongolia is Onon's hot spring with temperature of 70-80°. Its ingredients are chloride, hydro-carbonate, natrium and magnum and it is pellucid liquid that tastes and smells like sulfur-hydroxide. This spring has been used to cure illnesses such as central and peripheral nerve system diseases, joint diseases, skin diseases, injury and wound. Setsen khan Sholoi's barn that was built during the 13th century remained till recent time and at that time of khan's only dignitaries used to own the spring and use it in a suitable time of year when it is good for treatment. Good men who were considered to be heroes of this time used to boil raw frozen meat in this hot spring. At present, people are working to create a comfortable environment at this place and many searches have been made in order to use this hot spring for treatment'. Another of Zanabazar's haunts was Khujirt (or Khujert, Uvurkhangai aimag). 'Zanabazar was a renowned polymath who applied his energy to the study of a staggering array of subjects. One of his interests was the medicinal properties of hot springs. He is known to have studied the waters of least four hot spring complexes in Mongolia and no doubt he himself took advantage of their curative and restorative powers. While traveling between the monastery of Baruun Khüree and his workshop at Tövkhon Zanabazar would have had numerous opportunities to stop at the extensive hot springs complex at Khujirt, on the edge of the Orkhon Valley. According to locals it was he who first studied the medicinal properties of these springs. Khujirt, located between what is now the popular tourist attraction of Erdene Zuu and the famous Orkhon Waterfall in the upper Orkhon Valley and easily accessible by road from Ulaan Baatar, is today a major resort with a sanatorium, hotels, and ger camps'. The above is attributed to the zanabazar.mn site's highlight of Zanabazar's hot spring hide-outs. Don has more on Khujirt. Finally it was the hot spring of Estiyn (Yestin) which Zanabazar also frequented. 'While overseeing the construction of Saridag Khiyd (see above-below) from 1654 to 1680 Zanabazar would have ample opportunities to visit Estiyn Rashaan (rashaan = mineral springs) twelve miles to the northwest. According to tradition he identified here up to twenty individual mineral springs and determined the medicinal properties of each. Even now some of the springs have small signs in Tibetan indicating what the water is to be used for, including ailments of the heart, teeth, eyes (one for the left eye and one for the right), nerves, nose, ears, innards, lungs, and so on. There are also two log bath houses with bathing pits. Herdsmen from the Tuul and Kherlen valleys still here by horse to take cures and retreats. My horseman when I visited here told me his cousin came here for seven days after a bad fall from a horse and after bathing daily in the bath houses came away cured. Locals also maintain that bathing in the larger of the baths will atone for big sins, while bathing in the smaller one atones for little sin'. The most well-known hot spring of Mongolia seems to be Tsenkher. It even has (had?) it's own organisation, Hot Spring Water’s Efficiency Association, though this seems / seemed more dedicated to exploiting greenhouses than encouraging soaking. The sole references date back to 2008. That said, there is little proof of nakedness. On internet at least. '“Tsenkher Jiguur” tourist camp is situated in the north of 480 km-s from Ulaanbaatar capital, in the north west of 120 km-s from Khara Khorum tourism destination. The tourist camp is comfortable one, located in the foot of forestry hills with beautiful nature view, neighboring to hot spa. The camp’s capacity is 20 ger rooms, 7 hotel rooms with heating system, which are capable to provide service for 80 persons simultaneously. There Mongolian and European meals are served in Ger restaurant. The Japanese styled inside and outside hot spa baths are made with original stones and rocks from the nature, so this bath makes people to feel the real natural spa environment and make them to relax and refresh very well. During bathing in outside spa bath travelers can observe glittering stars in the sky in nighttime. There guests have a nice chance to watch national concert with songs and dances, as well as to participate in camp fire works, are able to be provided with service of beauty saloon, massage and sauna. The springing out of deep earth hot spa contains simple alkaline structure of sodium of sulphuric acid with phtalic and with temperature of 86.5 degrees warmth. Spouting out speed is 10 liters per a second. This spa is very useful for treating any injuries, wound, radicle, fatique and depression, therefore, guests and indigenous people use it with much respect. In its surrounding area it is absolutely suitable to explore the picturesque nature view, to pick up flowers, to catch butterflies, arrange hiking, horseback trekking tours. Also it is considerably possible for exploring nomads lifestyle, nomadic civilization, riding yaks, catching horse, making horses calm, milking mares and cows, preparing milk products. In wintertime tourists like to have hot spa bath and trek on snow covered hills. Also in spring time tourists can explore Traditional New Year Holiday-White Month and participate in hunting wolves [!]'. Relax and refresh with dancing with wolves? 'The "baths" were dirty (and filled with big Mongolian men), the changing rooms were full of flies (see video), ...'. 'N47°19'8.8" E101°39'16.8" This tourist gercamp has a new modern design hot spring house with separate inside and outside pools for men and women, although apartheid in the outside pools is not enforced. Staff was clearly absent all the time. Towels too. No cleaning was done at all, and the next day the floors were still dirty. Pools were not being kept at the right temperature. Showers and toilets were malfunctioning. All the camp guests use the only showers working, because there aren't any in the ablution block. Without skilled staffing, proper cleaning and adequate maintenance, this new hot spring house will be out of service in a few years'. 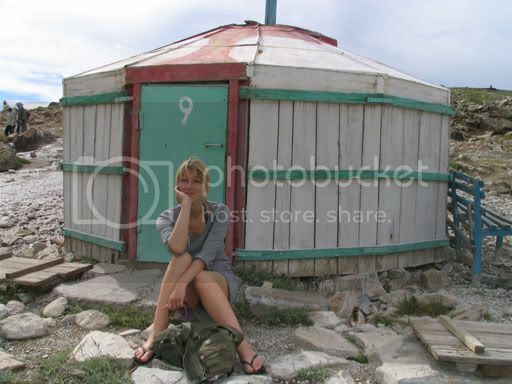 'I’d give Tsenkher hotsprings a 9 out 10'. 'Teel Rashaan (Hot Springs) on the Olziit River. Water is said to be good for digestive problems'. Photo by Don Croner. Lesser well known are the following hot springs. There are also a few photo's on flickr (not interesting enough(?) to repost here). Taats (Tsaats?) hot spring has received funding from UNDP's GEF to initiate 'development'. Also located in Uvurkhangai province. Teel hot spring (see photo above this paragraph) is located in Bayankhongor province. 'Shivert Resort provides state-of-the art wellness center built around natural hot springs. Our staff team is dedicated to answer all your questions and needs during your stay. Newly renovated facility  includes outdoor pools, natural treatment centers, sports facilities, large conference and dining rooms all in the middle of wilderness of Mongolia'. Despite the development, not much to be found. 'Mongolia. Hot Spa of Tsenkheriin Khaluun Us - 30 kilometers south of Tsetserleg town. The Shiveet Mankhan tourist camp in the back'. '... offering simple cabins around a former Soviet resort'. 'I was thinking more of a geyser in the ground - the 'springs' were situated in little wooden huts and were basically just a rectangular hole cut in the wooden floor containing very hot water. The baths came in temperature grades of 38, 43 and 48 degrees centigrade and although you were not permitted to take in soap or shower gel, we spent a good 30 minutes just soaking and trying to expunge the dirt we had accumulated from the previous few days' riding'. 'It is a hydro carbonat sulfas natrii hot spring'. 'Jargal Jiguur hot springs, sulphar springs that emerge from the ground (150m) at 70 degrees Celsius. Facilities include outdoor baths (male and female), showers and accommodation'. 'Nestled amid 70 Celsius natural mineral springs, with a knowledgeable, friendly, and professional staff, Jargal Jiguur offers an amazing spa experience. At this premier choice of Jargal Jiguur spas, cascading waters nurture more than skin and body -- they soothe the heart and soul. Visit our recently renovated, Japanese-style spa. Select from a bountiful array of soothing treatments from full body massages to anti-fatigue treatments. Whether you desire a dip in one of our naturally heated mineral spas or a private massage, you ’ll enjoy it in soul-relaxing fashion at our Jargal Jiguur hot springs spa resort'. 'Khunjil (mostly known Jargal) is a natural hot spring flows out whole year from the ground at 70 Celsius degree in mountainous North Mongolia. It is located 1580m a.s.l and in 730 km from Ulaanbaatar capital city, over 180 km south-west of Murun town in Khuvsgul province and 5 km south west Jargalant village'. 'There is only one tourist camp which is offering for tourists outdoor baths. They transfer the hot water via tubes and built some pools. Curative water and amazing nature featured by wooden mountains make this an excellent place for relax. Night bath is great. Sitting in the pool drinking while seeing stars at the dark sky is one of the favorite activity in here. The open air-baths are recommended'. Shargaljuut hot spring is a more often visited and more developed hot spring in Bayankhongor aimag. This web site describes Shargaljuut as 'well-known' and 'popular among Mongolians'. 'Upon entering the Shargaljuut springs, it immediately struck us that it was not as developed as we had hoped for. We had dreamt of large pools of water, immaculate service and Russian saunas. None of that. We had to cross some smaller rivers, made it this time, and ended up in a very basic ger camp. The hot springs are symbolic for the Mongol approach. Leaking tubes, old wooden gers, rundown buildings, unclear directions and too many people just hanging about. A hot spring was nothing more than a standard bath in a ger, to be filled with water. However, it must be said the water was fantastic and we felt like new'. It also has a Facebook site (188 likes)! 'Our private hot spring bath: luxury old school Russian bath tubs hiding inside'. Shargaljuut, taken in 2005 by Martijnopdemotor.